Doctoral research by Annemieke Witteveen at the University of Twente has shown that the number of follow-up visits for women after breast cancer treatment in the Netherlands could be reduced by about 9,000 visits per year. The follow-up could be offered based on the to the risk of recurrence, so that women with a low risk possible would need to revisit the hospital for a mammogram less frequently. Personalized follow-up reduces the burden on patients, care providers and possible the care budget. In the Netherlands, every day almost 50 women learn that they have breast cancer and this number is rising. At the same time the number of women who die of breast cancer is falling, because treatments have been improved and the disease is discovered at an earlier stage. After treatment for breast cancer, however, women run the risk that the disease returns: this is called a relapse. About 4% of women have a relapse in the same breast, and about 5% develop a new tumour in the other breast, within ten years of treatment. The aim of follow-up visits is to detect a relapse as early as possible, because this improves the outcome for the patient. Although breast cancer treatment is being provided in an increasingly personalized way, this is not the case for follow-up: this is still based on consensus, and is not tailored to the actual risk that a patient runs. Witteveen: "Right now breast cancer follow-up is the same for everyone for the first five years: a mammogram and physical examination every year. After five years, according to current guidelines, follow-up depends on the patient's age. However, different patients have different relapse risks, so it would be more logical for women who run a low risk to be given less frequent follow-up visits and women with a high risk to be given follow-up for perhaps longer than five years. My research revealed that women with a higher risk were actually having fewer follow-up visits than women with a lower risk. About half of all relapses are discovered by patients themselves, and not during a follow-up visit. And although follow-up can have reassuring results, a mammogram is not a pleasant thing to undergo and follow-up visits can cause anxiety and uncertainty. So if certain women run a very low risk of relapse, they are actually being given an unnecessary burden. At the same time this follow-up puts an extra burden on care providers – as well as generating additional costs, both for care providers and for patients." Mirjam Velting, program manager of the Breast Cancer patient coalition Netherlands (BVN): "Follow-up visits are not always medically necessary. This is almost never discussed with the patient, even though it is a decision moment during the discussions between the care provider and the patient." For these reasons it is important that follow-up is optimized on the basis of a patient's personal risk of relapse. To determine this risk, the Netherlands Cancer Registry (Nederlandse Kankerregistratie, NKR) has been. The NKR registers almost all new cancer cases since 1989, and the data set used for this research comprised almost 50,000 women. Together with the Netherlands Comprehensive Cancer Organization (Integraal Kankercentrum Nederland, IKNL) and care providers, Witteveen developed the INFLUENCE nomogram (www.utwente.nl/influence) with which the risk of a relapse can be determined. Witteveen's research also showed how breast cancer follow-up can be optimized for every possible relapse risk profile, taking the advantages of early detection and the disadvantages of follow-up (such as discomfort and anxiety) into account. 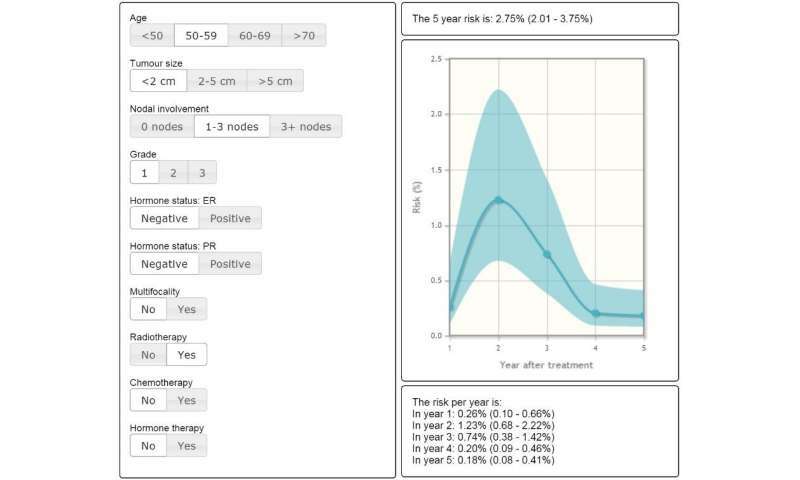 This model allows doctors and patients to assess the risks together and take the most appropriate decisions. Women running a higher risk can be given more frequent check-ups, if required, while patients running a lower risk are spared unnecessary check-ups. Professor Siesling, one of Witteveen's PhD supervisors: "Together with the care providers united in the National Breast Cancer group Netherlands (Nationaal Overleg Borstkanker Nederland, NABON), nurses, family doctors and the Breast Cancer Association (Borstkankervereniging), we as researchers are looking how this model can best be implemented in day-to-day practice. This has both statistical as organizational aspects – when and by whom – but it's also about presenting the risk itself in an understandable way. Moreover, follow-up is only a part of the after-care, in which also attention is payed to in example psychosocial complaints." Witteveen's research was part of the INFLUENCE project (INdividualized FolLow-Up for brEast caNCEr).